Sound It Out Records, Stockton on tees. 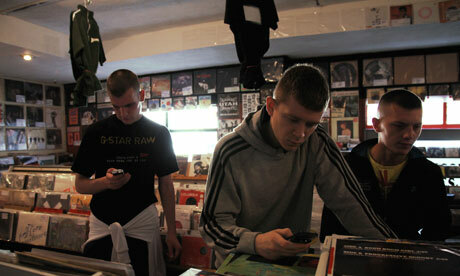 Independent record shops are a dying breed. Sound It Out is the self proclaimed ‘last surviving vinyl record shop in Teeside’ (they don’t recognise chains like HMV as being record shops up that way). This documentary is about that shop. 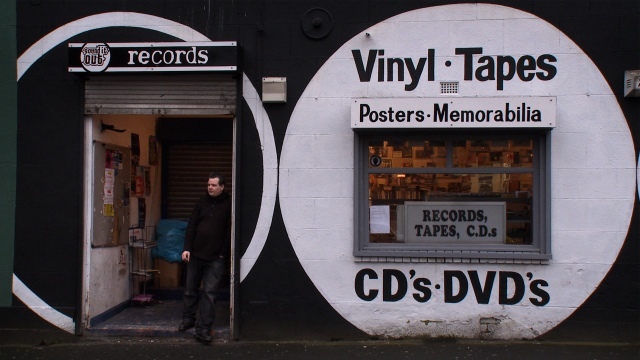 It is not so much the story of the shop; you don’t get the shop’s history or stories of its survival in the battle with the big chains and you don’t get celebrities popping in to tell of how they bought their first seven inch single there. It’s more a snap shot of the shop, its staff and its customers, at the time of filming (circa 2011 we think). A postcard from the world of record nerds, if you like. Record collecting has always been a predominantly blokey pastime, but this shop seems to take it to extremes. It is like the comic store on the Big Bang Theory, where women rarely ever set foot and the shop is just full of geeky blokes completing their collections. There is the bloke that is fanatical about Status Quo who will spend an entire week listening to Quo in preparation for going to see them live, wearing the Quo denim jacket that he has not washed since the band signed it for him. There’s the guy that has converted his garden shed into a DJ booth. And there is the bloke that wanders over from the pub across the road when he hears something on the juke box he wants to own. Being in Stockton on Tees, it is not a particularly cool or hip shop, they seem happy to stock just about anything (even Dire Straits and Status Quo). They stock around 70,000 records and CDs and Tom, the owner, pretty much knows where everything is – unless one of the staff has been rearranging things for the fun of it. They keep a shelf of bags full of records out back, the real world version of an on line shopping wish list, waiting for regulars to come in and buy them when they get paid. One guy sold his entire record collection to the shop now calls in to scrounge a cup of coffee and perhaps listen to one of his old records. High Fidelity, it is not, or even Last Shop Standing, and some of the characters in the film come across as sad and lonely individuals. But anyone out there that has ever been bitten by the record collecting bug will watch and empathise with the illogical passion of wanting to possess large quantities of physical copies of music. No doubt the MP3 generation will shake their head and wonder. We here at Peppermint Iguana found it charming and amusing, but we suspect its appeal will be strictly limited to similarly afflicted vinyl junkies. The fact that it has been around for five years with us being blissfully unaware of its existence speaks volumes, but finding the film was like finding an import version of an album by your favourite band that you never knew existed. If you get that feeling, you will get this film. “My record collection will be finished when people stop selling records”. Sums it up really.